Each of these were important milestones, with CEV marking the beginning of a broader movement to measure and value natural capital. In 2012, WBCSD founded the Natural Capital Coalition with key partners in the field. Today, the Coalition provides a critical network for the growing number of organizations and individuals interested in natural capital measurement and valuation. Through the Coalition, WBCSD led technical development of the Natural Capital Protocol, the first-ever standardized framework for businesses to measure their impacts and dependencies on nature. The accompanying Natural Capital Protocol Toolkit helps businesses find the tools they need to implement the Protocol. Natural infrastructure solutions are often cost-efficient and reduce a company’s risk exposure. They also have compelling benefits to society and the environment. For example, creating or restoring wetlands on river banks and streams can increase biodiversity and be more cost-effective than traditional storm water control measures. Developed with the WBCSD Water Cluster, you can now figure out how you can benefit from natural infrastructure via this online hub with case studies, tools, a video and more. Biodiversity underpins healthy ecosystems and natural capital. Halting biodiversity loss is a global priority. We want to help business better measure, value and report on biodiversity. We are committed to contributing to the Biodiversity supplement to the Natural Capital Protocol that is being developed by the Cambridge Conservation Initiative and the Natural Capital Coalition. We are always looking for innovative ways to address biodiversity loss, and partner with leaders in the field. For example, we continue to engage with the UN Convention on Biological Diversity, IUCN Business and Biodiversity program and other key organizations. Over the years, we’ve invested significant resources in building capacity within business on what ecosystems are and how to manage them, most notably through the Business Ecosystems Training (BET). 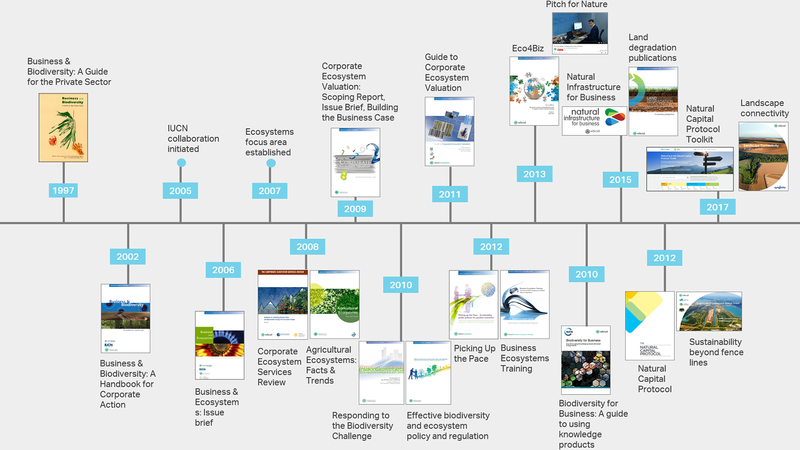 BET includes slides, facilitation notes, illustrative case studies and exercises to help your company learn how to manage risks and opportunities related to ecosystems more efficiently. You can also check out ENABLE, an online landscape restoration training tool developed by an international group of organizations including Rotterdam School of Management, Erasmus University, Commonland, United Nations University Land Restoration Training Programme. We participated in the Advisory Group for ENABLE along with ELM (Economics of Land Degradation), IUCN, and others. We are always interested to know about other training programs that could benefit business on different aspects of natural capital measurement, valuation and management. The opportunities associated with restoring degraded lands has business taking action on the topic. The UN Convention to Combat Desertification COP 13 in Ankara was an important milestone for bringing business together on the global goal to reach Land Degradation Neutrality. We were a key partner in organizing the event. You can explore our Issue Brief, key messages for policy makers and the business perspective on land degradation neutrality to see how your company can get involved. If you’re ready to get on board and make a change in the field, check out our call to action on landscape connectivity. For more on landscapes, have a look at our Climate Smart Agriculture work.